Description: Beaded "Embroidery" and dimensional flowers complement the bias band neckline of this "Milano Satin" spaghetti strap dress. 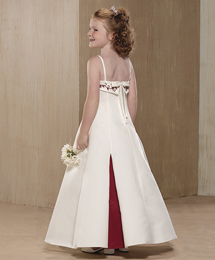 Contrasting "Dove Satin" insets accent the back of this princess line style. Accessories: Includes self crinoline. White or Ivory accented with your choice of Dove Satin colors as the inset.